For thousands of refugees, migrants and overseas visitors to Christchurch Ngāi Tahu kuia, Sally Pitman, is the embodiment of manaakitanga. As refugee and migrant sector advocate for Te Rūnunga o Ngāi Tahu, Sally regularly welcomes manuhiri as varied as diplomats, construction workers and refugees to her rohe, telling them stories of the land and her tīpuna. Her whanaunga, and rūnunga CEO, Mark Solomon asked her to take on the role in 2011 following the February earthquake. In its immediate aftermath, international recovery teams arrived in the city followed by construction workers from countries like Ireland and the Philippines. “Mark made a commitment to include migrants and refugees under the mana whenua umbrella, but he couldn’t be everywhere at once so he asked me to manaaki the newcomers,” says Sally. Sally has a long history of community service. She spent 20 years working in Christchurch for Parekura Horomia, often helping other iwi going through the settlement process. In the last decade she has worked more with new New Zealanders alongside fellow refugee and migrant support workers like George Clark of DevPlus. “Ngāi Tahu’s right as mana whenua to welcome people to this area has not always been understood by our city fathers and immigration authorities,” George says. George and Sally had long seen the need to bring Christchurch’s Māori, Pākehā and ethnic communities closer. They decided that a practical first step in this process would be to establish a migrant and refugee centre, housing both Māori and mainstream refugee and migrant service providers. They’d just signed the lease on a building to house the new Centre when the February earthquake struck, destroying the proposed site. When Rehua Marae in the suburb of Richmond offered them space, they jumped at the opportunity to deepen relationships between tangata whenua and new New Zealanders. In a quake damaged ciity, Rehua Marae quickly became the coordination point for Christchurch’s different ethnic communities. The new Interagency Network included Ngāi Tahu, migrant and refugee communities and Christchurch’s Pākehā and NGO communities as equal partners. It immediately developed a Māori kaupapa. The result was a raft of hugely positive outcomes. “We started every morning with a karakia before getting down to the business of helping the 50 or 60 people who arrived every day to tell us what they needed,” says George. 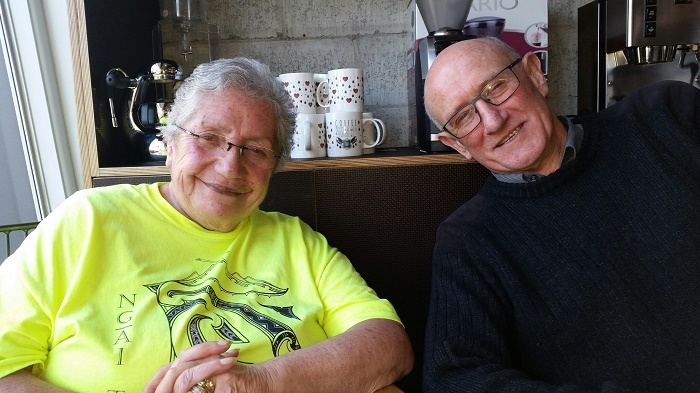 Pōwhiri and karakia became normal and Sally was available to tell newcomers, and locals, about the history of their city and the whakapapa of the house they were meeting in. “Māori ways of expressing manaakitanga and sharing the stories of the land felt natural to many overseas manuhiri. They’re often from extended family with similar whānau values and they recognised the same things in their cultures,” says Sally. One of their initiatives was a kaumātua group which reached out to older members of migrant and refugee communities, many of whom had little English and who felt isolated in their homes. They began meeting regularly, often sharing meals. “We’d have Somali women in their coloured robes, turbaned men from various Middle Eastern communities, Chinese families, Pākehā and Tangata Whenua all sharing a meal together. Many couldn’t speak English but they would come, week after week, to enjoy the kai and the fun of being together,” Sally said. George says people are fascinated when Sally tells them a history of the area. “I tell them about the advice my Ngāi Tahu tūpuna gave the city council, that the land from Amberly to the Cashmere Hills was swamp and not to build there,” Sally says. The fact that they didn’t listen and future generations had to live with the consequences gives her no pleasure. The Interagency Network has recently moved to Christchurch City Council facilitation but both George and Sally believe its first years at Rehua Marae not only introduced foreigners to Aotearoa’s unique culture, but broadened their Pākehā colleagues’ understanding of manaakitanga and the role of mana whenua in their city. They also credit E Tū Whānau with influencing their way of working. “Communities tend to work within their own community, but E Tū Whānau’s championing of Māori values, especially, in this case, manaakitanga, has challenged and encouraged us to reach out to different groups,” says George.